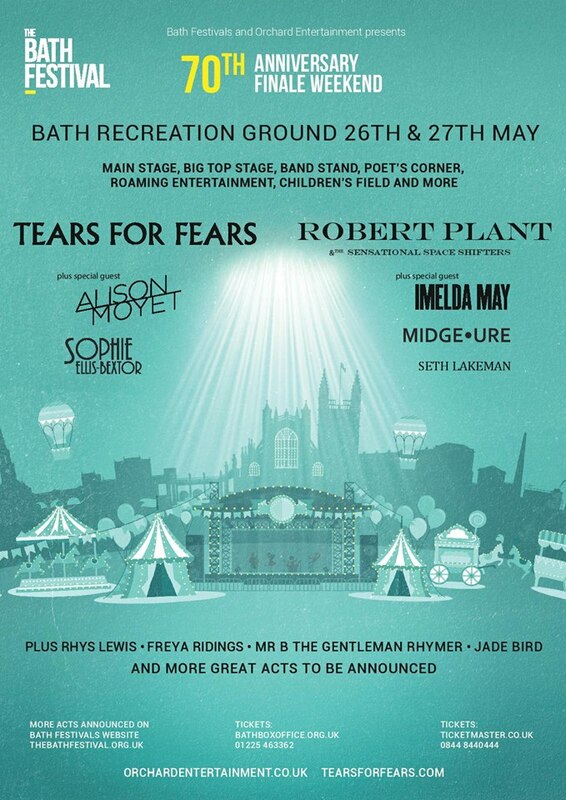 Imelda May, Sophie Ellis-Bextor, Midge Ure, Seth Lakeman, Rhys Lewis, Jade Bird, Freya Ridings and Mr.B The Gentleman Rhymer + and still more announcements to come! Almost 50 years after Led Zeppelin performed at Bath Blues Festival (1969), Robert Plant and The Sensational Space Shifters return to the city. With a powerful and wide vocal range that has given him a successful singing career spanning over 50 years. Plant is regarded as one of the greatest singers in the history of rock and roll. On sale now! @robertplantofficial and the Sensational Space Shifters to headline on Sunday 27 May at #TheBathFestival finale weekend. Tickets can be purchased from www.thebathfestival.org.uk. Tears for Fears are an English pop rock band formed in Bath in 1981. They had international chart success with hits including Shout, Everybody Wants To Rule The World, Head Over Heels, Sowing The Seeds Of Love and Mad World. Alison Moyet is an English singer/songwriter famous for her bluesy contralto voice. With hits such as Only you, All Cried Out and Invisible, her UK album sales have reached a certified 23 million with over a million singles sold. The finale weekend takes place 26th and 27th of May and will also include family activities, busking bandstand, a big top stage, poets corner and roaming entertainment. Don’t miss out on this unique opportunity to see some of the UK’s most talented performers in the beautiful, historic city of Bath.